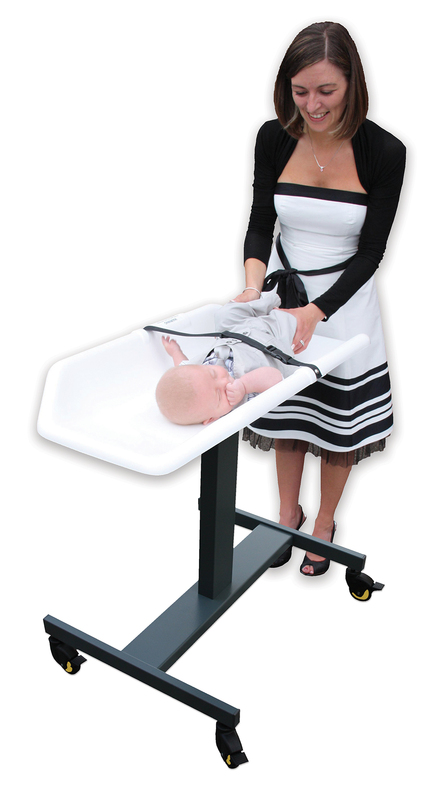 The Trolley or Floor mounted series of baby changing tables have been designed to provide a safe, hygienic, and ergonomically sound facility when a portable floor mounted requirements has to be met. Typically this occurs for a variety of reasons, such as unsuitable wall structures, insufficient space for a bench facility, short term events/exhibitions etc. or day clinics on post natal wards and surgeries. 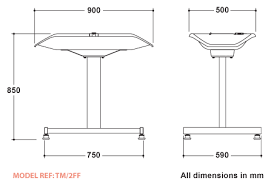 Both models are identical except for the provision of anti static braked castors (TM/2FW) or fixed feet (TM/2FF). Because of the very durable robust construction of these products along with their enhanced stability they are particularly suitable for situations where children with special needs might be encountered, and although more expensive than conventional solutions, there are no fitting costs involved. – Large radii on all projecting surfaces to avoid the risk of bruising. – Unrestricted access to the baby free of surrounding obstructions. – Permanently fitted safety belt with a tamper proof snap fit closure to BS 6684 1989. – Reinforced Polyester moulding shaped to fully support babies from 0-30 months designed without sharp corners to avoid the possibility of accidental injury and free of internal cavities for hygiene. – All materials are fully compliant with the BS EN 71 part 3 Toxicity regulations. 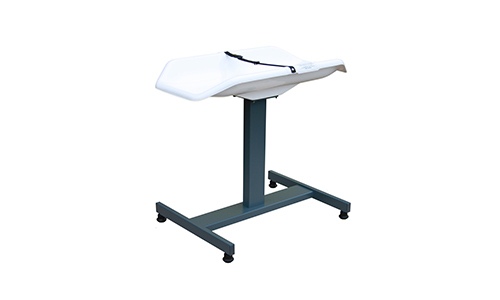 – The trolley or floor mounted table has an integrally moulded steel chassis transmitting the working load (Rated @ 125kg) to a centrally mounted fixed height column supported by an H section lower frame supporting a choice of fully braked 75mm anti static castors (TM/2FW) or fixed feet (model TM/2FF). – All materials are in excess of the requirement for the Building Regulations ‘Spread of Flame’ requirement BS 476 part 7 class 3. – Both models are supplied in flat-pack form, the only tool required for assembly being an adjustable, or preferably a 13mm ring spanner. – All individual components can be replaced in the event of extreme wear or vandalism, thus avoiding costly whole product replacement.